Vixi saw that Garurumon had made it back, and was happy to see him. Tripping over her own feet, she stopped herself from hugging him, not wanting to ebarass herself, but succeeding never-the-less as she had tripped. Kris was telling the large dog digimon how Butterflymon hadn't made it after Devimon attacked. Vixi felt that she was partially responsible, but made no sound to attract any further attention, she wasn't feeling well in the fact that she missed home, and now the main protection was gone. Last edited by Grey Matter; 06-10-2009 at 05:11 PM. Kat noticed Kris telling Garurumon Butterflymon didn't make it out. "However, I do still have the Digiegg of Knowledge." Kat had no idea why she was telling a complete stranger this; she had no idea if it was really the Garurumon with Ophanimon! She waited to see what Garurumon had to say about her statement. I guess it was hooking up with Serebii again. Goddamn it. 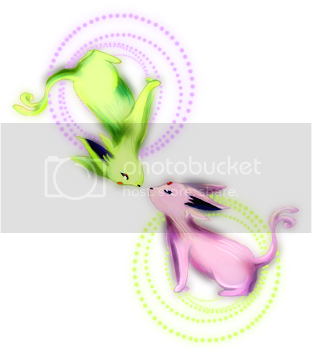 Skiyomi of SerebiiForums for the Espeons. "So, how much longer must we wait before we can meet Ophanimon?" Jason asked the Garurumon.